A multi-governmental task team has been established to consider ways of supporting the family of a six-year old boy who fell into an open trench in Giyani, Limpopo. 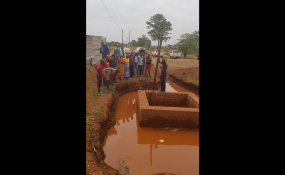 Nsuku Mhlongo died after falling into a manhole chamber that was left open by a construction company and service provider for the Giyani Intervention Water Project. The team, led by Mopani District Municipality Mayor Nkakareng Rakgoale, officials from both provincial and local Department of Water and Sanitation, Lepelle Northern Water and community representatives, visited the Mhlongo family on Monday. The team has decided to conduct an assessment of all open trenches in the area and to immediately close uncovered pits to prevent more fatalities. The officials also committed to, not only assist the family with funeral arrangements, but also lend a helping hand should the family decide to take legal action against Khato Civils. The Department of Water and Sanitation said government regretted the incident and offered condolences to the Mhlongo family on the untimely passing of Nsuku. In its efforts to ensure that the Giyani Intervention Water Project is completed, the department said it is in the process of dispatching its Construction Unit engineers to go on site in Giyani as a matter of urgency. The Giyani Intervention Water Project has been under implementation since August 2014 and has to date delivered approximately 92% of the original scope of work. "There is currently a very high risk that some of the achieved project outputs are likely to be lost due to vandalism of incomplete work or loss of materials on site. The phase 1 of Giyani needs approximately R420 million to make the infrastructure functional," the department said.